This week has been brilliant. Absolutely exhausting due to the lack of sleep but good things have happened. Really good things. Each day I am getting more and more messages from folk excited by what I am doing, or inspired by my reasons for doing so. I have been completely humbled by some of them – like the lady who hadn’t spoken out about her arthritis for ten years, but had now decided after reading about my plans that she had the courage to go public to her friends. Woah, I thought. This project has resonance for many more people than me and those directly involved. We have welcomed two new sponsors on board – both Silver financial sponsors, buffering the coffers extensively and meaning that the majority of the final bills can be paid without me having to ebay any of my toes or kidneys to make up the deficit! Many thanks to OzSale.com and Natracare for their support. I can now sleep much more easily for the final few weeks before I leave for Oz. Plastimo have also joined the crew with a huge stash of safety and technical equipment – again, very much appreciated. There will still be bills to pay while I am at sea – the amount of money we have in the kitty will determine how frequently and to what extent I will be blogging while I am away, so any other corporates reading this then please do get in touch if you would like to talk about sponsorship. Thursday was a very special day indeed. A real landmark and also a bit of a tear jerker for me. 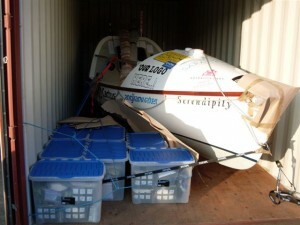 For I took ‘Dippers down to Tilbury Docks in Essex for loading into the container that will be her home for the next 30 days as she wends her way out into the Channel, the Med, through the Suez Canal, up across to Singapore and then down to Fremantle. 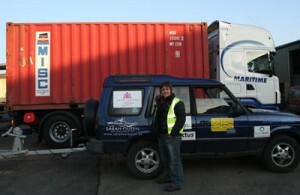 Huge thanks to the chaps from Starlift who helped get her into her little box and pack in all the food. Next time I see her we’ll both be ‘down under’, ready to go rowing! Another thank you to all the sponsors who have supplied kit or discounts this last couple of weeks – Cadbury, Aquapac, Natural Balance Foods, GreenPeople, Udderly Smooth, Aimia Foods, B-Well, Less Bounce and Berghaus. And of course to Mum and brother # 1, Matthew for helping load up the food parcels, tweak the kit and pack the boat and my folks from Whisper.pr for their continued efforts. We are most definitely going rowing! Happy happy days. our school the splash safety at sea, marine and nautical school has just heard about your program. we have been in tough by Mr Linsay Noé we did told him that we will help for this action be a success and we will pray so that it help along these three month. we wish to know what we can do else. Wow, so cool, I am truly jealous at this point. 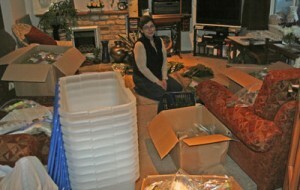 To be packed up and ready to go must be a great relief. Now that the hard part is done all you have to do is cross the indian ocean 😉 piece of cake right? any idea of the event time ?? Alan – hello there! How goes it in Wales? Saw Geoff the other week – he’s on good form. Hoping to leave around mid March from Oz – I fly out there on Feb 25th. How was the holiday? Can’t remember where you were going but it was somewhere warmer than here, right?! Will be watching your progress. 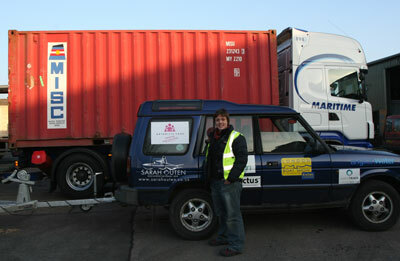 OceansWatch wishes you a safe, enjoyable and speedy trip! Just a note to say good luck from all at Teddies. We will be thinking of you and looking forward to reports. God speed and take care.